SAN DIEGO — Athletic-Minded Traveler(R) today announced that Hyatt Hotels & Resorts’ North American properties will provide jogging and fitness-walking guests with palm-size route cards designed by Athletic-Minded Traveler(R), a leading healthy-travel and lifestyle media firm. Hyatt is the first major hospitality company to partner with Athletic-Minded Traveler and will feature the maps as part of the StayFit@Hyatt program at participating Hyatt Regency and Grand Hyatt properties. “Our staff of active-lifestyle experts is extremely proud to provide Hyatt guests with individually-researched route maps,” says Jim Kaese, Co-Founder of San Diego-based Athletic-Minded Traveler, LLC. Global Hyatt Corporation, headquartered in Chicago, is one of the world’s premier hotel companies. The hotels owned, operated, managed or franchised by its subsidiaries provide authentic hospitality to guests in 45 countries through a passionate commitment to personalized service, cultural relevance, and the environment. Global Hyatt subsidiaries own, operate, manage or franchise more than 365 hotels and resorts worldwide under the Hyatt(R), Hyatt Regency(R), Hyatt Resorts(TM), Grand Hyatt(R), Park Hyatt(R), Hyatt Place(R), Hyatt Summerfield Suites(R) and Andaz(TM) brands with additional properties under development on five continents. Global Hyatt Corporation is also the owner of Hyatt Vacation Ownership, Inc., operator of Hyatt Vacation Club(R). The success of Global Hyatt is driven by the commitment and energy of the approximately 90,000 men and women around the world who provide exceptional service to hotel guests. From the U.S. and Canada, reservations for any Hyatt hotel worldwide may be obtained by calling 1-800-233-1234 or visiting www.hyatt.com. Based in San Diego, Athletic-Minded Traveler LLC is a leading active-lifestyle media company providing unique content and resources to Fortune 500 corporate travel and wellness/work-life programs, print and online media firms, and the travel and fitness industries. 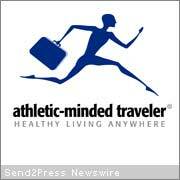 Inquiries can be addressed at 1-877-272-6657 or: http://www.athleticmindedtraveler.com.